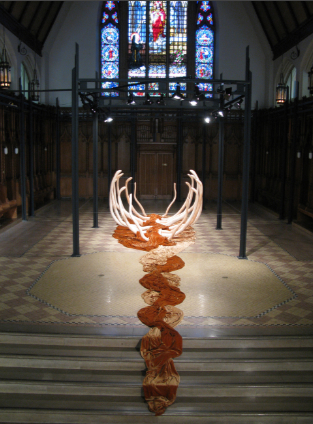 RibRaft was exhibited at The Quebec Craft Museum from September 24, 2009 to January 10, 2010. A catalogue of the same name was published in conjunction with the show. The catalogue can be purchased at the museum (www.mmaq.qc.ca) and a copy is also placed in La bibliothèque Nationale du Québec. RibRaft uses the body as a stage of representation. It appropriates both the skeleton of a boat and the rib cage of the human body. Its combined symbol was chosen to speak about my journey through motherhood as a way to capture the in-between spaces that compromised the myriad of transformations I experienced as I navigated toward my present identity. It futher speaks of the journey as a process that is constantly changing. The reference of the rib cage, a symbol of the dead, was a way for me to speak of the lives of the women before me. In addition, it was a way of placing myself within the greater history of mothers. Located on the altar space of the former Neo-Gothic Church this space acts as an important historical location for my French-Irish background. As such it also occupies a position of power since the altar (the most powerful space of the Church) has traditionally excluded women. I love your work, Toni! I’d love to stay in touch. We met at Mamapalooza and you kindly held my son Harper for a while so I could actually listen.